It’s Day 302 and I had a great time creating today’s piece. It was a nice difference compared to yesterday’s tribute. 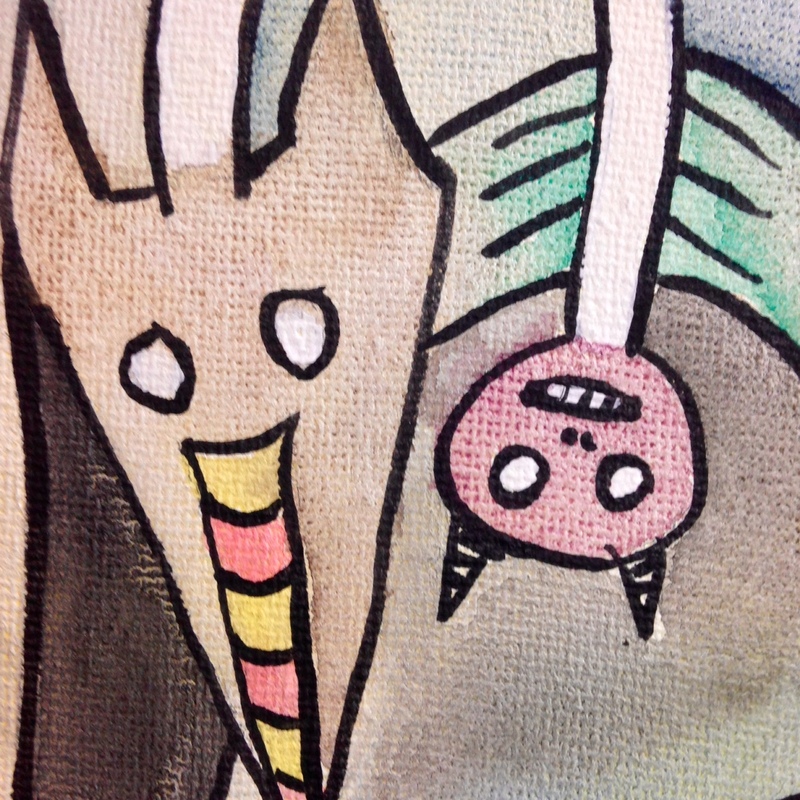 Join me in honoring Wifredo Lam today. 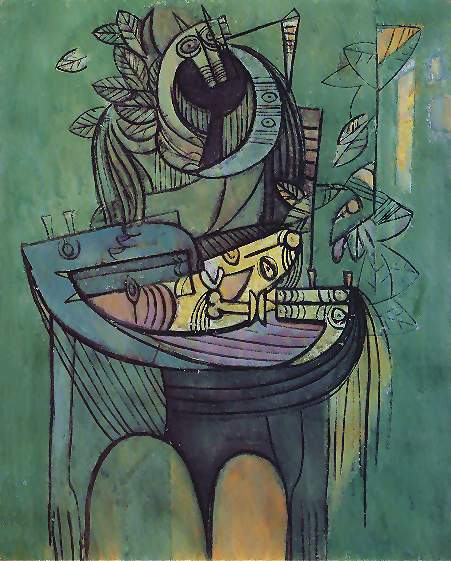 Wifredo Óscar de la Concepción Lam y Castilla (Chinese: 林飛龍; pinyin: Lín Fēilóng; December 8, 1902 – September 11, 1982), better known as Wifredo Lam, was a Cuban artist who sought to portray and revive the enduring Afro-Cuban spirit and culture. Inspired by and in contact with some of the most renowned artists of the 20th century, Lam melded his influences and created a unique style, which was ultimately characterized by the prominence of hybrid figures. Though he was predominantly a painter, he also worked with sculpture, ceramics and printmaking in his later life. Chinese immigrant and his mother, the former Ana Serafina Castilla, was born to a Congolese former slave mother and a Cuban mulatto father. In Sagua La Grande, Lam was surrounded by many people of African descent; his family, like many others, practiced Catholicism alongside their African traditions. Through his godmother, Matonica Wilson, a Santería priestess locally celebrated as a healer and sorceress, he was exposed to rites of the African orishas. His contact with African celebrations and spiritual practices proved to be his largest artistic influence. In 1916, Lam moved to Havana to study law, a path that his family had thrust upon him. Simultaneously, he also began studying tropical plants at the Botanical Gardens. From 1918 to 1923, Lam studied painting at the Escuela de Bellas Artes. However, Lam disliked both academic teaching and painting. He left for Madrid in the autumn of 1923 to further his art studies. In 1923, Lam began studying in Madrid under Fernando Álvarez de Sotomayor y Zaragoza, the curator of the Museo del Prado and teacher of Salvador Dalí. In the mornings he would attend the studio of the reactionary painter, while he spent his evenings working alongside young, nonconformist painters. At the Prado, Lam discovered and was awed by the work of Hieronymus Bosch and Pieter Bruegel I. While his early paintings were in the modernist Spanish tradition, his work soon became more simplified and decorative. Though Lam’s dislike for academic conservatism persisted, his time in Spain marked his technical development in which he began to merge a primitive aesthetic and the traditions of Western composition. In 1929, he married Eva Piriz but both she and their young son died in 1931 of tuberculosis; it is likely that this personal tragedy contributed to the dark nature of his work. strife, in some ways, mirrored that of the former slaves he grew up around in Cuba. Therefore, at the outbreak of the Spanish Civil War, Lam sided with the Republicans where he used his talent to fashion Republican posters and propaganda. Drafted to defend Madrid, Lam was incapacitated during the fighting in late 1937 and was sent to Barcelona. There, he met Helena Holzer, a German researcher, and the Catalan artist known as Manolo Huguë. Manolo gave Lam the letter of introduction that sparked his friendship with Picasso, whose artwork had impressed and inspired Lam a year before when he saw an exhibition in Madrid. In 1938, Lam moved to Paris. Picasso quickly became a big supporter of Lam, introducing him to many of the leading artists of the time, such as Fernand Léger, Henri Matisse,Georges Braque and Joan Miró. 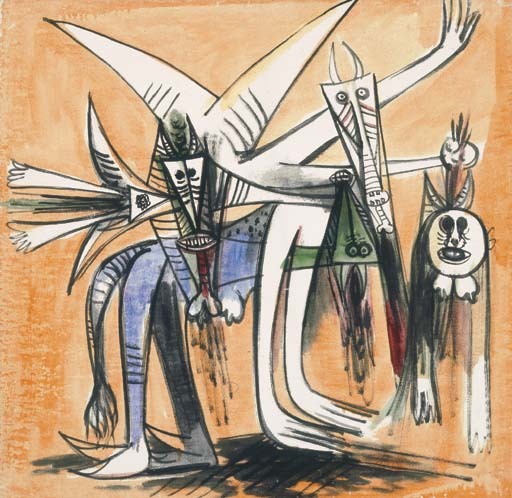 Picasso also introduced him to Pierre Loeb, a Parisian art dealer; Loeb gave Lam his first exhibition at the Galerie Pierre Loeb in 1939, which received an enthusiastic response from critics. 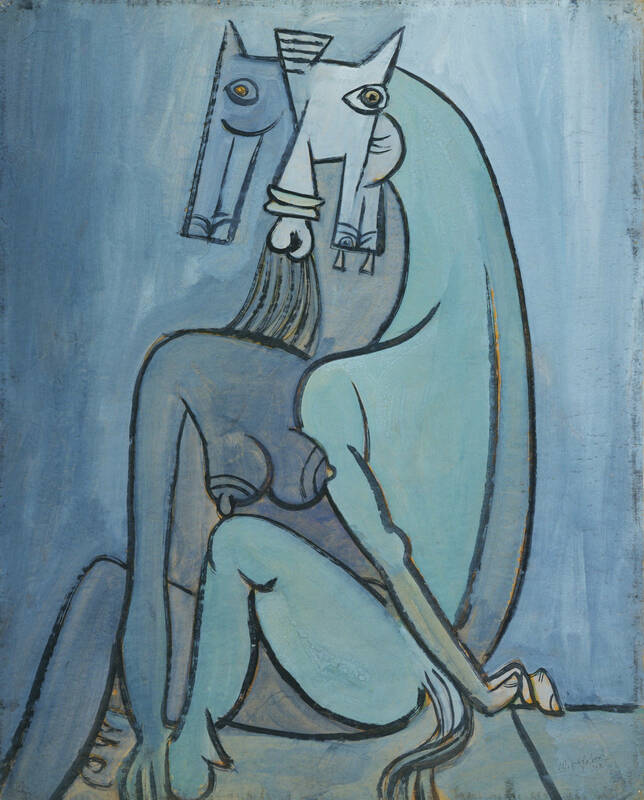 Picasso and Lam also exhibited their work together at the Perls Galleries in New York in the same year. Lam’s work went from showing the influence of Matisse seen in his still lifes, landscapes and simplified portraits to being influenced by Cubism. 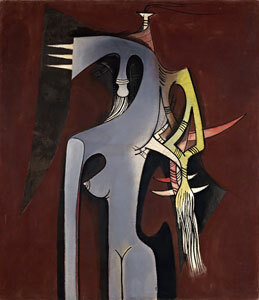 Mainly working with gouache, Lam began producing stylized figures that appear to be influenced by Picasso. Much of his work in 1938 possessed emotional intensity; the subject matter ranged from interacting couples to women in despair and showed a considerably stronger African influence, seen in the figures’ angular outlines and the synthesis of their bodies. While Lam began simplifying his forms before he came into contact with Picasso’s work, it is apparent that Picasso had a significant impact on him. With regard to Picasso’s exhibition, Lam said that it was “not only a revelation, but… a shock.” Lam gained the approval of Picasso, whose encouragement has been said to have led Lam to search for his own interpretation of modernism. With the outbreak of World War II and the Germans invading Paris, Lam left for Marseille in 1940. There, he rejoined many intellectuals, including the Surrealists, with whom he had been associated since he met André Breton in 1939. In Marseille, Lam and Breton collaborated on the publication of Breton’s poem Fata Morgana, which was illustrated by Lam. 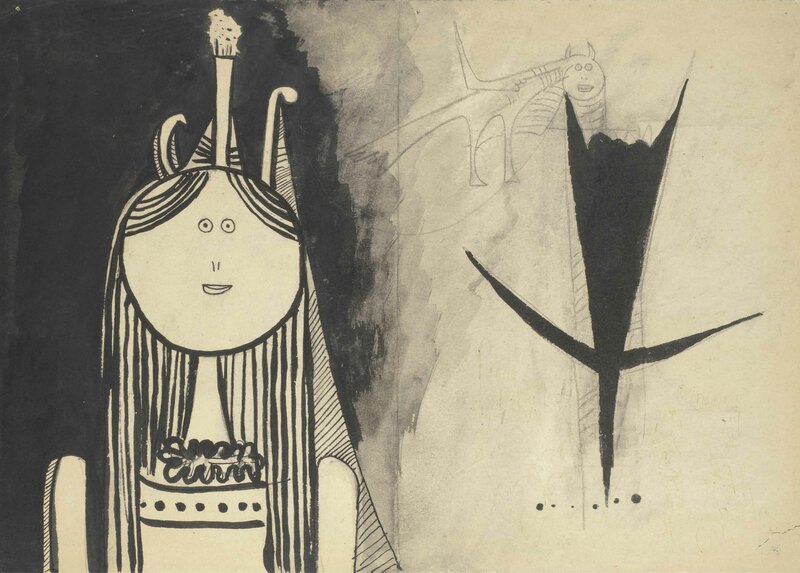 Though the drawings he created in Marseille between 1940 and 1941 are known as the Fata Morgana suite, only about three inspired the illustrations for the poem. In 1941, Breton, Lam and Claude Lévi-Strauss, accompanied by many others, left for Martinique only to be imprisoned. After forty days, Lam was released and allowed to leave for Cuba, which he reached in midsummer 1941. Additionally, his time in Cuba marked a rapid evolution of his style. Drawing from his study of tropical plants and familiarity with Afro-Cuban culture, his paintings became characterized by the presence of a hybrid figure—part human, animal and vegetal elements. 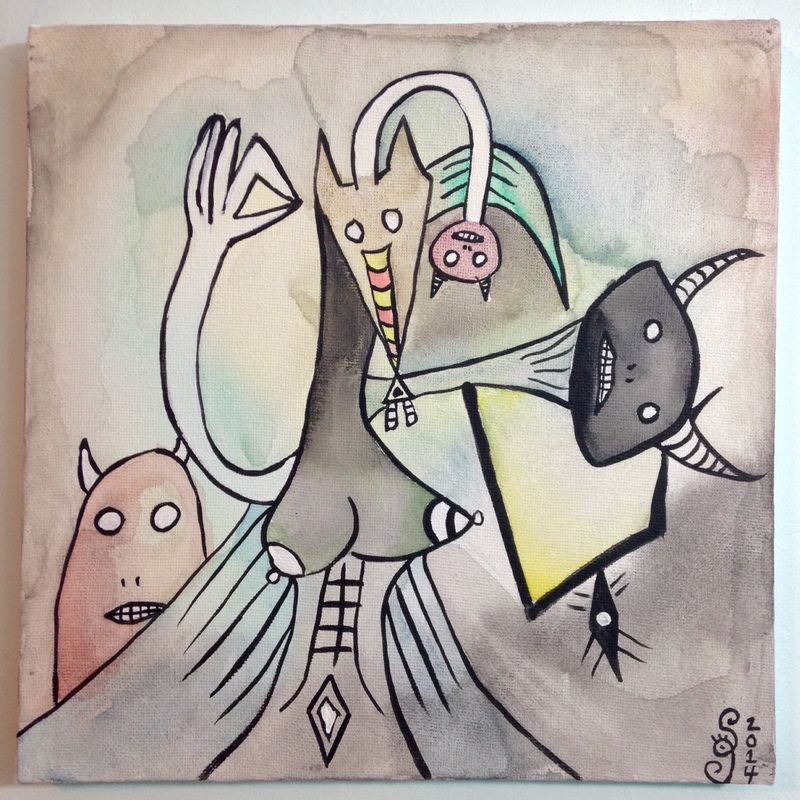 His style was also distinctive because of its fusion of Surrealist and Cubist approaches with imagery and symbols from Santería. In 1943, he began his best-known work, The Jungle. It reflected his mature style, depicting four figures with mask-like heads, half-emerging from dense tropical vegetation. Later that year, it was shown in an exhibition at the Pierre Matisse Gallery in New York where it created controversy. The painting depicted the tension between Modernism and the vibrancy and energy of African culture. The Jungle was ultimately purchased by the Museum of Modern Art N.Y. 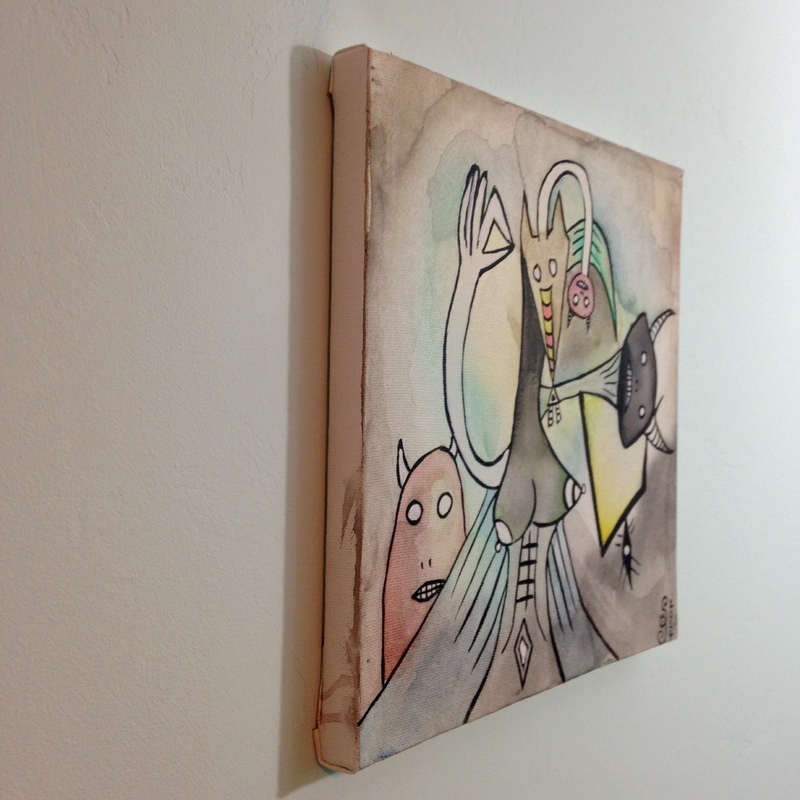 It is often compared to Picasso’s Guernica, which is hung in the Museo Reina Sofía in Madrid. Lam continued to simplify and synthesize abstraction yet continued painting figurally; he also kept on developing the mythology and totemism that defined his style. In 1944, he married Helana Holzer, whom he divorced in 1950. In 1946, he and Breton spent four months in Haiti, enriching his already extensive understanding and knowledge of African divinity and magic rituals through observing Voodounceremonies. Although he later said that his contact with the African spirituality that he found throughout the Americas did not directly impact his formal style. African poetry, on the other hand, was said to have had a broadening effect on his paintings. 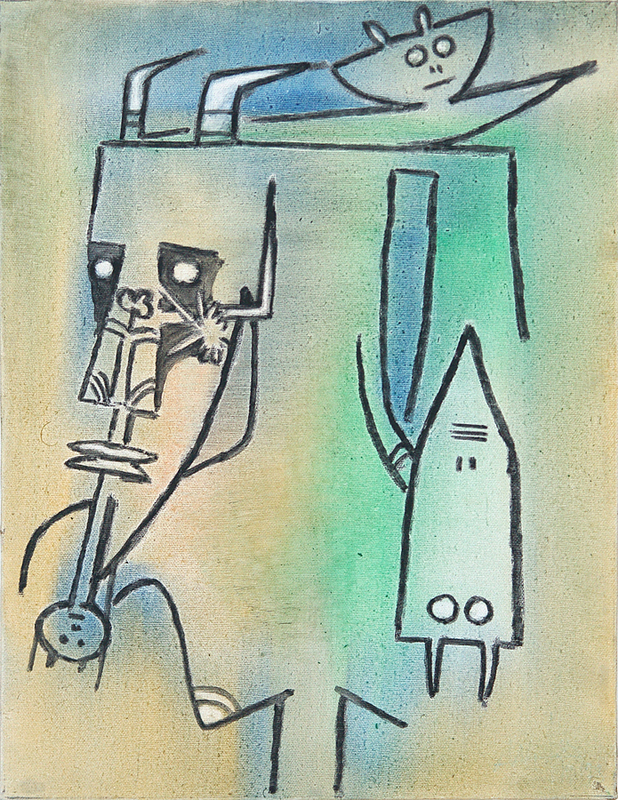 In 1950 Wifredo Lam worked together with René Portocarrero and others in the village Santiago de Las Vegas, the group of painters worked on ceramic. In 1952, Lam settled in Paris after having divided his time between Cuba, New York and France. Lam, who continued to sympathize with the common man, exhibited a series of paintings at Havana University in 1955, to demonstrate his support for the students’ protests against Batista’s dictatorship. Similarly, in 1965, 6 years after the revolution, Lam showed his loyalty to Castro and his goals of social and economic equality by painting El Tercer Mundo (The Third World) for the presidential palace. In 1960, Lam established a studio in Albissola Marina on Italy’s northwest coast and settled there with his wife Lou Laurin, a Swedish painter, and their three sons. In 1964, he was awarded the Guggenheim International Award and between 1966 and 1967 there were many retrospectives of his work throughout Europe. At the encouragement of Asger Jorn and after being intrigued by the local pottery making, Lam began to experiment with ceramics and had his first ceramic exhibition in 1975. He progressed to model sculptures and cast in metal in his twilight years, often depicting personages similar to those he had painted. 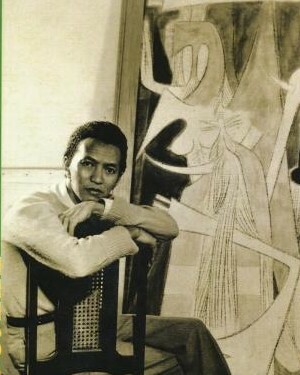 Wifredo Lam died on September 11, 1982 in Paris. Having had over one hundred personal exhibitions around the world, Lam had a well established reputation by the time of his death. Lam, like many of the most renowned artists of the 20th century, combined radical modern styles with the “primitive” arts of the Americas. 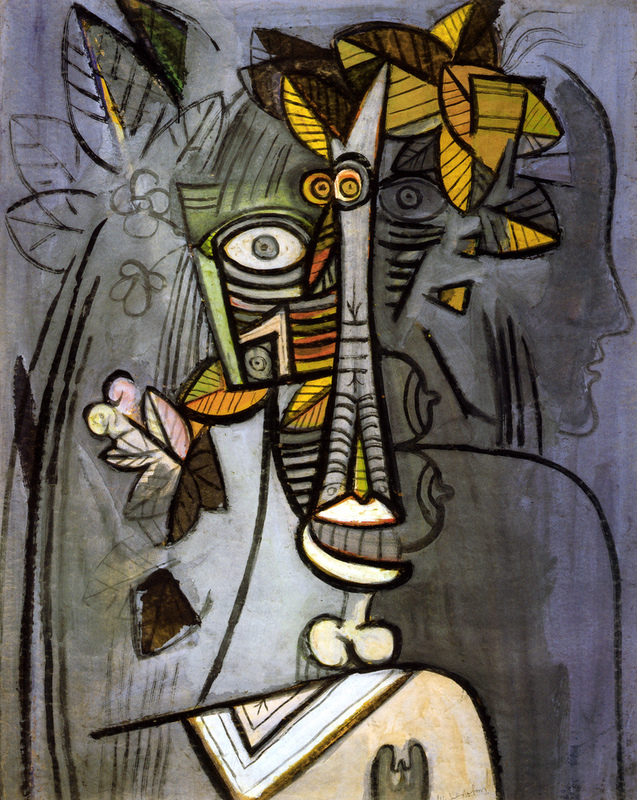 While Diego Rivera and Joaquín Torres García drew inspiration from Pre-Columbian art, Wifredo Lam was influenced by the Afro-Cubans of the time. Lam dramatically synthesized the Surrealist and Cubist strategies while incorporating the iconography and spirit of Afro-Cuban religion. For that reason, his work does not singularly belong to an art movement. He held the belief that society focused too much on the individual and sought to show humanity as a whole in his artwork. 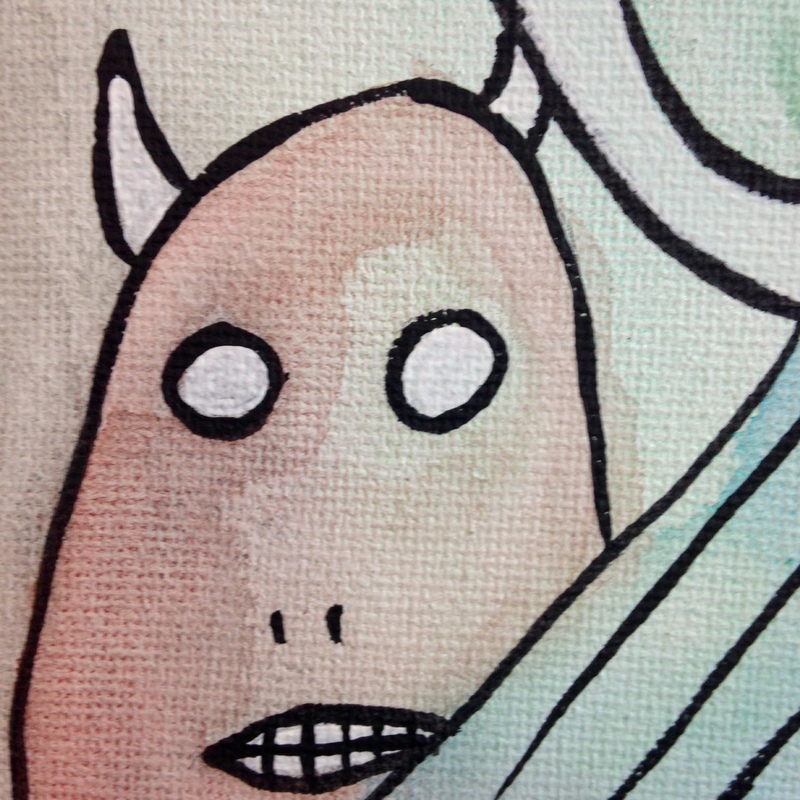 He painted generic figures, creating the universal. 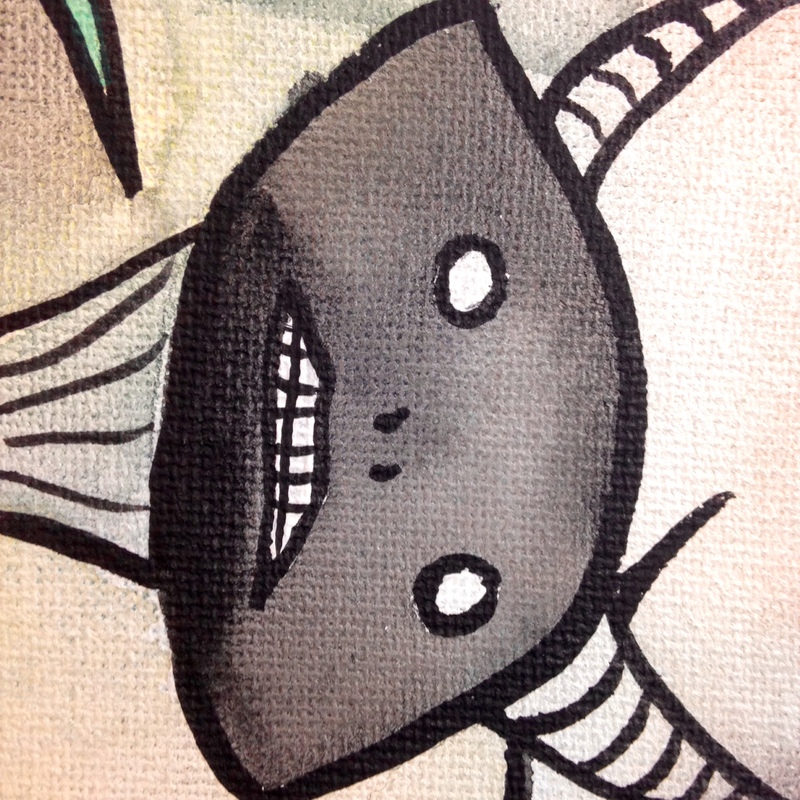 To further his goal, he often painted mask-like faces. While Cuban culture and mythology permeated his work, it dealt with the nature of man and therefore was wholly relatable to non-Cubans. I hope you enjoy my piece for today! I will see you tomorrow on Day 303.